I met with an executive management team recently to discuss their commitment to developing themselves as a high performing team. During that discussion, one of the executives responded to something another executive had said and their response left me thinking that they had heard something very different to what I had heard. It was pretty clear that their response was based on a lot more than what had just been said, that it was some reaction to the way they were listening to what had been said. In a HBR Article titled “Everything you need to know about becoming a better listener”, Sarah Carmichael points out that there can be a distinct difference between what you hear and how you listen to what you hear. 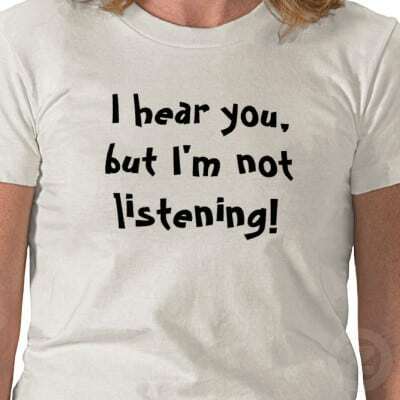 We all hear a statement the same way, however, we can listen to that statement in very different ways. The way we listen shapes our perceptions and the way we respond is determined by those perceptions. It was patently obvious in the meeting referred to above that one key issue the team will need to address is the way they are listening to each other and therefore how they perceive each other and how those perceptions have come about. Until this is resolved, there will be no high performing team. In our experience, listening to people and leadership teams in ways that empower them to be the best they can be is one of the most powerful leadership competencies you can develop. It creates the right environment for high performance with individuals and leadership teams. It starts with appreciating that you can create the way you listen and an understanding of the impact that will have, either positive or negative. For example, a complaint could be someone whinging or someone who is committed enough to speak up. How you choose to listen to the person complaining will determine how you address the complaint. As a leader, others will see how you respond to people who speak up and complain and that will affect a lot of things – how people approach or don’t approach you, how they in turn respond to complaints and ultimately the organisation’s culture and its performance.